Cette cabine A-cadre est entièrement équipée pour votre escapade. Il comprend une chambre avec un lit king-size et une mezzanine avec un lit queen-size, un coin salon et un canapé-lit dans le salon. Il ya aussi un pack-n-play. Il ya un jacuzzi sur le pont arrière avec un espace barbecue et un coin salon. Ne hésitez pas à sauter sur un vélo et la tête droite à l'arrière sur le chemin. 3 vélos adultes, 2 vélos d'enfant. Le Village Mall est à courte distance de marche ainsi que SHARC parc aquatique et Fort Rock Park. Comprend 4 SHARC passe par jour. Il ya deux TV avec lecteur de DVD. La cuisine est entièrement équipée pour votre usage et une machine à café Keurig, il ya une laveuse et une sécheuse et il ya une cheminée à bois dans le salon brûler pour se réchauffer sur ces froides nuits d'hiver. Cute cabin with all the fixings! 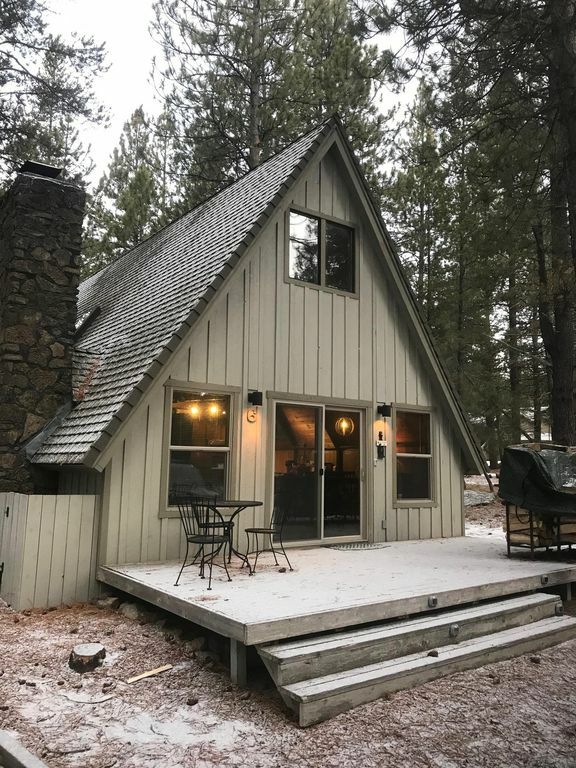 A few friends and I stayed at this lovely cabin for a weekend retreat and appreciated the fully stocked pantry, the abundance of blankets , and the fully shoveled out areas to the trash area and the hot tub! It was a treat to be able to use the hot tub while it was snowing. My only complaint was the lack of lights in the loft. But otherwise a comfortable and pleasant stay- i’ll be using them again in the summer ! We loved this cabin! It was very cozy and comfortable. My husband and I rented it for a long weekend and enjoyed sleeping in the loft. The hot tub was also perfect for cold Central Oregon nights and stargazing. We will definitely rent this property again! I'm so glad that you enjoyed it! Can't wait to have you back! I had a great time at this cabin. Here are my few nits. I wish there was an information binder at the house to tell you what to do with the trash, etc, but we managed without it. The hot tub was really nice but the lid is really difficult to get off and on. The fire place came stocked with wood. The flue was tricky to operate. I couldn't tell if it was open or not without getting smoked out. You'll pay with cash app which was super easy. Everything was really amazing besides those small items. We'll definitely be back. And Michele is incredibly helpful and responsive. The coziest cabin there is! I LOVE this cabin! I kept saying that multiple times when I was there. It's just so cozy and rustic. I slept with the upstairs window open one night and didn't hear ONE sound all night long. The beds have super thick foam pads on them that's like laying on a cloud. I like the orange shag carpet upstairs that is probably original but clean. I like how each bedroom has a VHS player AND DVD player, plus Blueray in living room. The shower head is probably the best shower head I've ever used. The coolest bikes are there.... 2 stylish red retro looking cruiser bikes for men, then 1 cruiser bike for women which had the comfiest seat!, and 3 kids bikes. In order to bike to the mall, Sharc, or the big meadow, you have to bike along Beaver drive downhill... when you are coming back, uphill, it is killer! SO I recommend bringing a bike rack so that you can transport the bikes to the areas that are more level, OR bring a multispeed bike, OR bring a bike with a motor on it. My friend and I BARELY made it home biking along Beaver Drive. There's no way around it, unless you have a bike rack or multi speed bike. We had a great time at the Cabin! It is the best! I LOVE it! Great location. Love the A frame. Clean, cute cabin. Fire wood for cozy fire. Lots of kitchen items. We brought our own coffee maker but there is a Keurig. Great to have a heater in the bathroom. Tire pump for bikes and bike locks would be great additions. Hair dryer didn’t work. Some jets in hot tub need repair. Fan in bathroom didn’t work. A great visit overall. We would stay here again. Thank you.